Happy Independence Day! I often wish that I could be more cosmopolitan. I’d love to travel to Europe, maybe parts of Asia, or Africa. I even sometimes wonder what it’s like to live in another country, and speak more than one language! But, as I think about being from somewhere else, I can’t help but be grateful to be an American. We have so many freedoms in the U.S.A.! I am thankful for my brave European ancestors who risked everything to come to America for a better life. I have enjoyed many blessed years in my homeland, and by God’s grace, I hope to enjoy many more. 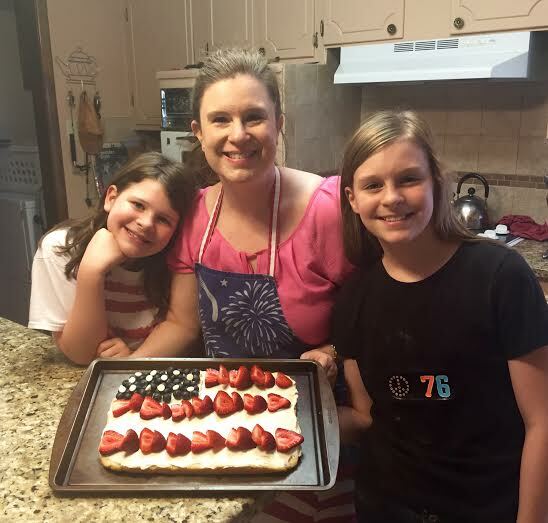 Last week, Laci found a picture online of a fruit pizza made to look like Old Glory. It looked so cute and sounded tasty, so we decided to make one ourselves. I’d never made a fruit pizza, but it wasn’t difficult at all. I found a recipe for Union Jack (the British flag), and made it look like our flag instead. When Terry saw the recipe with a photo lying on the counter, he asked, “Why are we making the British flag on Independence Day?” Ha! That would be funny, wouldn’t it? I quickly told him that I was making the right flag for the day. First, line a 9 x 13 inch cake pan with foil, then spray with baking spray. Next, make one sugar cookie package mix according to the directions on the package. Spread the dough in the bottom of the lined cake pan. Bake at 350 degrees for 15-20 minutes. I used the Krusteaz brand because the other brands were sold out. The crust was a little thicker than I expected, but wow! It tasted great! Let this cool completely (about 30 minutes) before adding the frosting. Remove cookie from the foil and put on a cookie sheet or another plate. Spread frosting across the cooled cookie crust. 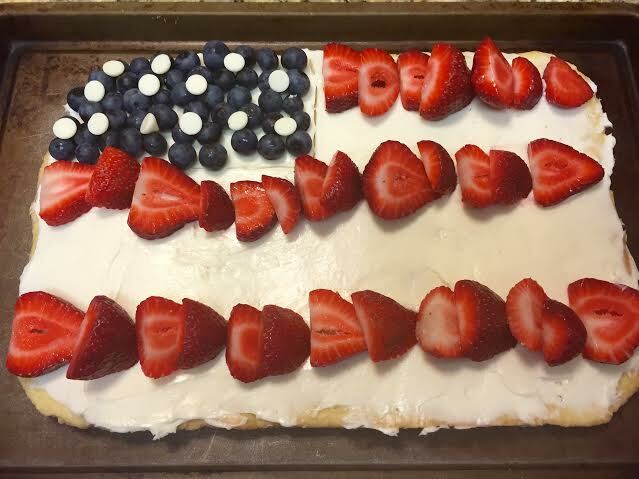 Use blueberries and strawberries to make the cookie look like Old Glory, and vanilla or white chocolate chips to make some “stars” among the blueberries. Refrigerate until ready to serve. After snapping some photos, we cut the slices and added more fruit, especially blueberries, to the individual servings. Click HERE for the original recipe I used. It is a blessing to live in the “Land of the free, and the home of the brave”, but through Christ we can have the greatest freedom of all, freedom from sin. And God’s grace knows no boundaries. Well done, ladies! Looks delicious! Must have been fun doing it w the girls. Will try your recipe soon. Oh, and of course, have to do the British flag. 🙂 Thanks for that wonderful picture you tagged me on Facebook. That looks wonderful, and I’m sure it tasted good. When I saw the photo on my phone, I thought it was the flag cake that has been around a long time, the one made with slices of pound cake. This is a nice variation. Yum!